Today I am thrilled to be sharing my latest project with you. 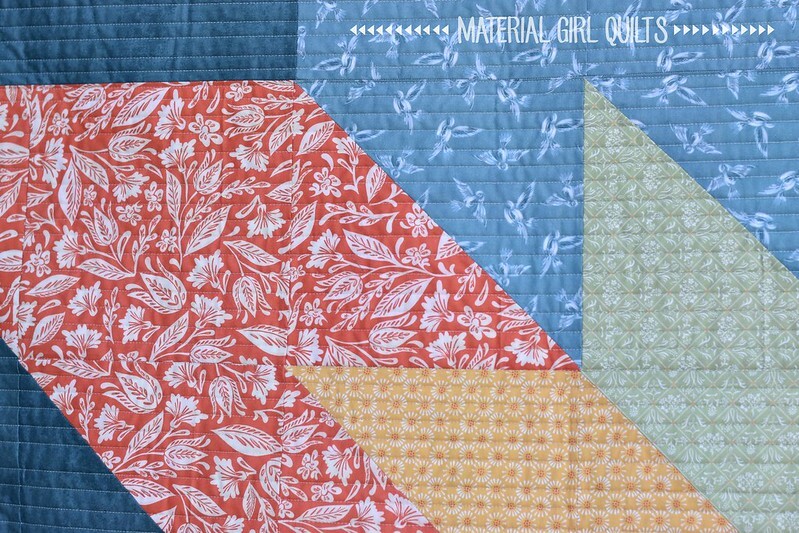 But before I get to that, I want to share about Free Spirit Fabrics latest designer, Marian of Miss Mustard Seed. When Free Spirit reached out to me about this latest line, I hadn't heard of Marian, so I went to her website to check it out. Let me warn you, when you do the same thing, you'll likely fall in love with her style just like I did! She started as a one-woman-show decorative painting and mural business, evolved into an antiques business that tripped into a blog and blossomed into a entire brand. I'm very intrigued by her Miss Mustard Seed Milk Paint Line and am now looking for furniture I can update! Marian's debut line with Free Spirit is Bunnies, Birds and Blooms. It is filled with lovely shades of blue, green, yellow and the most gorgeous shade of orange. I chose two prints from each of those colors along with the Milk Paint background fabric in Flow Blue. 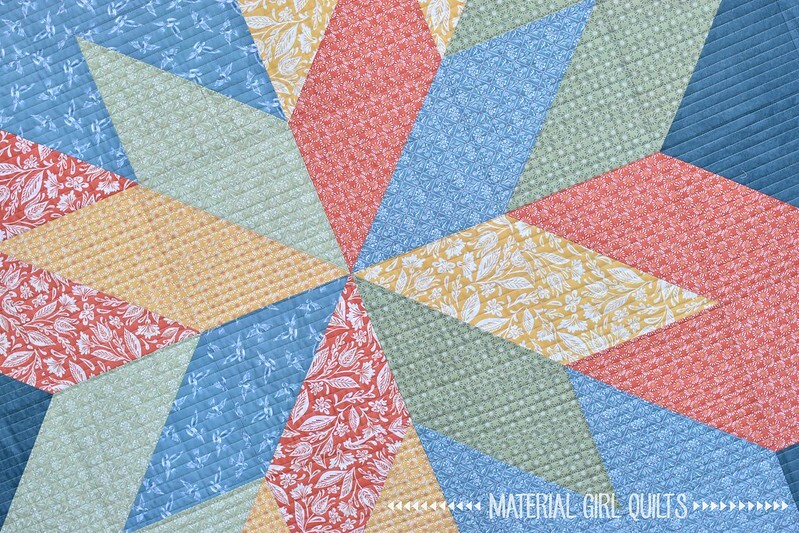 When searching for quilt design inspiration, I asked my son what I should make with these fabrics and he said a "star within a star" . . . this is the end result. 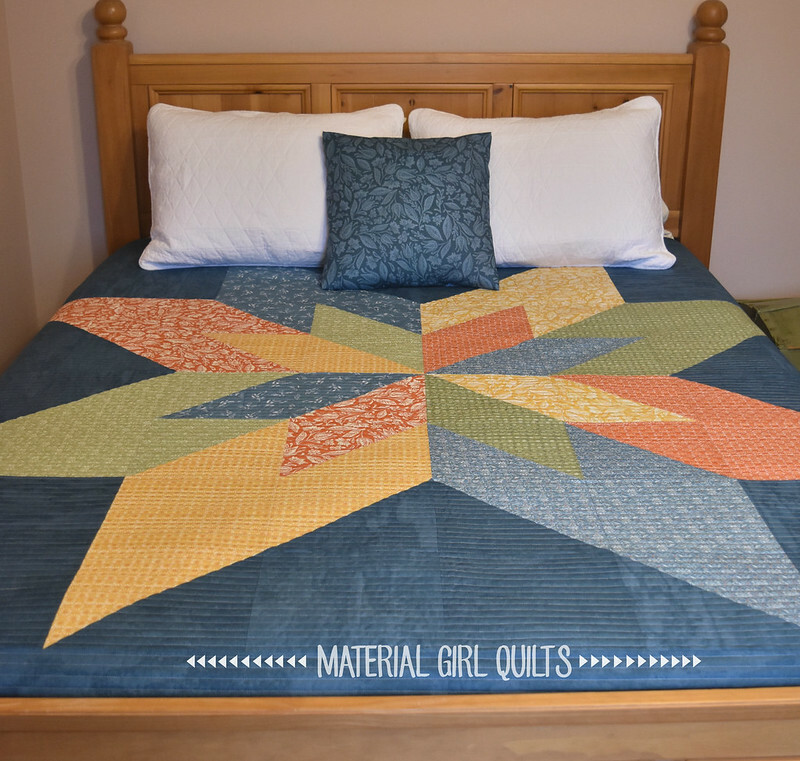 As you can tell, this is a very large quilt, with not too many pieces, so it was a pretty quick finish. 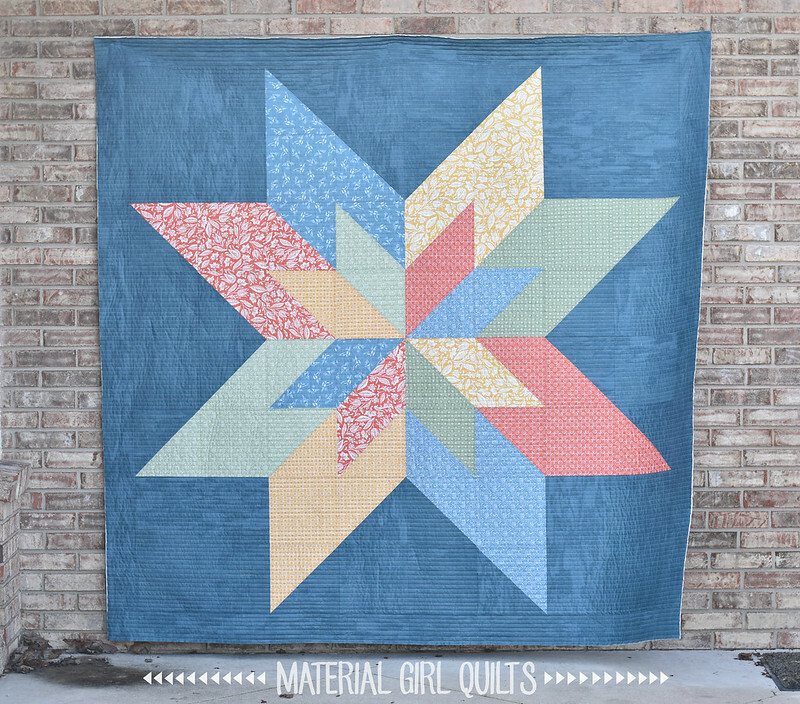 I love how striking the large stars are against that dark blue background fabric. 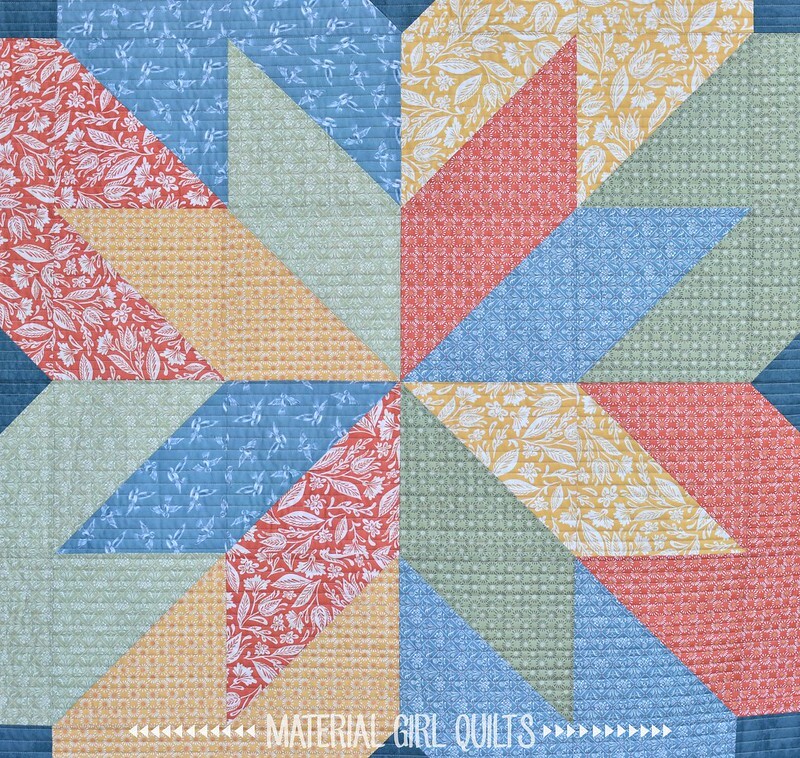 I added lots of yummy texture with straight line quilting using Aurifil 50 wt. thread every 1/2" or so. I have to wait until this line hits stores next month so I can purchase some more of the milk paint fabric to use as my binding (I used up every inch of it that I had for the borders!!). Once it is bound and washed, it is going to be so cozy. I think my favorite fabrics are the "Leafed Out" and "Scattered Flock" prints below. Here it is fitting perfectly on our queen sized guest bed. To see some more projects made with Bunnies, Birds and Blooms, follow along on the Instagram tour (schedule is below). Along the journey, if you share the work of these instagrammers using #MissMustardSeedinstagramtour, I understand that you may be chosen to win some of your own Bunnies, Birds and Blooms! 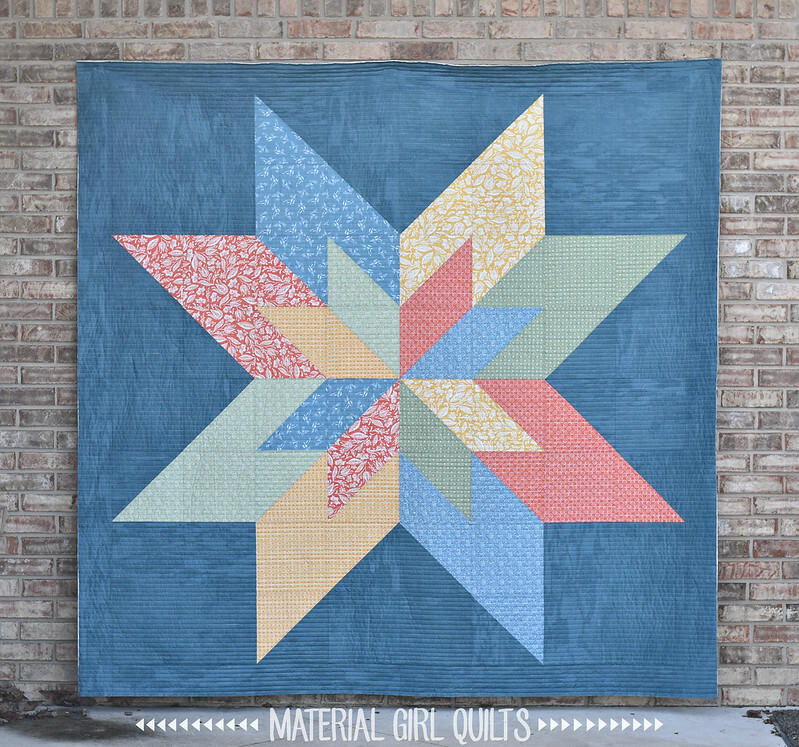 If you'd like to make a Double Star quilt for yourself, you can find the free pattern here.